I hope everyone had a good Labor Day weekend. My weekend involved travel and good times with family, but no sewing. However I have managed to finish the small green & gold wallhanging (17″ x 23 1/2″). Isn’t it cute? 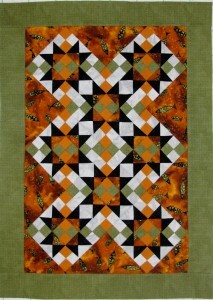 Once it is quilted, this will look great hanging in my sewing room. 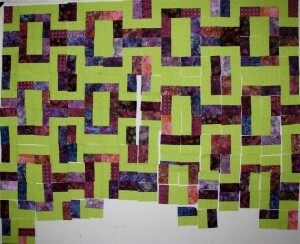 I have also been working on the green & purple quilt. After making a couple of blocks, I decided to layout all the rail fence pieces. This way it will be easier to make sure that the lighter and darker fabrics are distributed through the top. This is the last green quilt top. The next project up is a Blue Ridge Beauty in – of course – blue and tan.